1. Become familiar with all the information on this web site and on the web sites of the Department of Historic Resources, Preservation Virginia and the National Trust for Historic Preservation. Learn as much as you can about the tools available to help you identify, preserve and use your community's historic buildings, sites and districts. Become familiar with the local, state and federal incentives for the preservation of historic resources. Learn about the process for nominating and listing places on the Virginia Landmarks Register and the National Register of Historic Places. Make sure you understand how the consequences of national and state designation differ from those of local overlay zoning ordinances. 2. Learn who are the players in your community. They include the planning commission, building inspector, fire inspector, architectural review board (if any), city/county attorney, chamber of commerce, local preservation organizations, community business associations, local elected officials and the nearest field office of the Department of Historic Resources (the Commonwealth's historic preservation office). 3. Assess attitudes toward preservation in your community. Although you may be aware of them, assess them anew. Be as objective and as open-minded as you can. As we all know, some times those who are most passionate about something are too close to it to see opportunities and road blocks clearly. The success of a local advocacy campaign will depend largely on your being alert to the cues you receive from other community leaders in government, business, the media and civic organizations. Attitude. Ask people in the community what they think about local historic preservation and historic places. Are property owners, businesses, agencies, etc. making decisions based on an erroneous or outdated understanding of preservation and preservation tools? Tourism development. Are the historic sites in your community being developed to their full potential? Are there sites that could be developed better? Does you community participate in Historic Preservation Month or Virginia Archaeology Month or Virginia Civil War Trails? Is you community active with a local committee to support the commemoration of the 150th anniversary of the American Civil War in Virginia? Participation in statewide programs. Does your local government and business community take advantage of the Virginia Main Street program or take the Virginia Main Street approach to downtown revitalization? Has your locality become a Certified Local Government for its historic preservation program? Is your community recognized as a Preserve America community? Has it participated in the state's Cost-Share program for funding historic resource surveys? Are historic sites in your community recognized on the Virginia Landmarks Register or the National Register of Historic Places? Investment in historic infrastructure. Do local property owners, businesses and investors take advantage of state and federal rehabilitation tax credits? Does the school system identify and rehabilitate older schools before building new ones? Do you local real estate and economic developers "sell" new industry and development based on your community's historic character? Erection of highway markers. Have any state historical highway markers been erected in recent years along highways in your jurisdiction? Have they been funded by private initiatives, by your locality, or both? Your locality's current comprehensive plan. This should be available from your planning or local government office and should tell you the extent to which your local government has taken account of historic resources in its blueprint for the future. Current historic districts and other officially designated sites (if any). This information will help you judge how much emphasis has been placed on preservation in the past. To confirm the information from the planning or local government office is complete, call the Department of Historic Resources for up-to-date listings. Local incentives for historic preservation. You local government may give property owners local incentives for rehabilitation asuch as tax abatements or the use of proffers in zoning decisions. Your local preservation organization may offer design assistance or have its own revolving fund. Current local zoning designations. It is important to know what specific development rights go with each designation. Review your jurisdiction's Historic Designation Zoning ordinance (if any). Guidelines and procedures of the local architectural review board (if any). These may include guidance on recommended and not recommended treatments of historic features and on review and approval of proposed changes in locally designated historic districts or areas. Building and fire codes as applied to historic properties. Problems arise if building and fire inspectors apply the codes more narrowly to historic buildings than codes allow. If, after doing your research, you conclude that your community relies on regulations without reliance on incentives and education, consider trying to balance your community's program as part of your campaign. 4. Develop case studies of museums and rehabilitation projects that produce economic and cultural benefits. The main purpose of case studies is to give your arguments credibility. Ideally, case studies will be success stories from your jurisdiction or nearby. Museums, battlefields, historic sites, and archaeological sites contribute to the economy by drawing visitors. To prepare a case study on an historic attraction, find out the annual visitation level, then call your economic development officer or convention and visitors bureau (if any) to find out how much those visitors might be expected to contribute to the economy (by staying in hotels/motels, eating in local restaurants, using local services, etc.). Find out how many students and school groups visit the site and how often it is used for conference, weddings, receptions, etc. If you can, find out the attraction's payroll and the value of contracts and services it purchases each year. Find out how much the gift shop brings in and how much tax revenue the shop and site generate. In short, prepare a brief on the economic contribution the attraction makes to your local economy each year. This kind of data can be used to show that historic preservation makes good economic sense. The second kind of case study focuses on single site rehabilitation, neighborhood revitalization and downtown revitalization projects that contribute to the economy by attracting investment and producing jobs and revenue. Find out how much investment the project has attracted. Try to calculate how many jobs the project has supported and what kind of impact the project has had on the community's economy. Use a before and after approach to determine how much the project has contributed in tax revenue to the community as compared to before the project was undertaken. 5. Identify properties in your community that have not been rehabilitated to become community assets, but which have the potential to be success stories in their own right. 6. Investigate roadblocks to effective local preservation. Effective preservation may mean different things to different communities. One community may benefit most from developing its tourism potential. Another may find that the jobs and investment generated by historic districts and tax credits are most beneficial to the historic resources, the woenrs and the community. Some communities may want and need historic district zoning. Others may find that a Main Street approach works best. Analyze your local ordinances and policies to understand where the disincentives and roadblocks to preservation are in your community. Analyze where gaps in understanding may get in the way. Lack of knowledge about what incentives may be available, about how zoning affects use of property, and about how code regulation may affect design and potential use often cause property owners and the community to miss opportunities for growth and renewal. Lack of knowledge about the benefits and tools of historic preservation may cause property owners to miss opportunities for recognition and gain. Realtors, business development officers, lenders, developers and others sometimes lack understanding of local ordinances and policies. A community commitment to ensure that they have complete and accurate information will eliminate surprises and reduce last-minute conflicts. 1. Turn first to local preservation advocates. Form a team from among the leadership of your local nonprofit preservation organization (if any), local members of the Preservation Virginia, museum professionals, our local historical society,architects, archaeologists, historians, owners of historic properties and other preservation-minded citizens. Is X on record in support of historic preservation? Does something in X's professional background suggest X should be supportive? Does X have a personal interest in history, architecture or archaeology? Are X's friends or members of X's family interested in preservation? Is X interested in seeing the community obtain the benefits of preservation (business attraction, neighborhood or downtown revitalization, heritage preservation, heritage tourism, education, rekindled civic pride, a renewed sense of community and citizenship)? If you answer "yes" to any of these questions, approach X about joining your team. The challenge is to find areas of common ground and the "right" person to make the approach. Your research will likely identify at least one individual in local government who will be receptive to your ideas. Once you have found a potential friend, meet with this individual. Explain your ideas and plans. Ask for support, advice and ideas. 3. Look outside the "preservation choir." Building a broad base of support will facilitate community acceptance of your efforts. By explaining the economic, educational and civic benefits of preservation, you should be able to enlist business, media, education, religious and civic as well as governmental leaders. Whether they realize it or not, developers, educators, downtown business people, attorneys, bankers, realtors, public relations specialists, investors, academics, hoteliers, and restaurateurs are among those who may benefit directly from an active preservation program. To identify likely allies, use a process similar to the one used to find government allies. After contacting your prospects individually, make them a part of your team. Now search for opportunities to have a qualified speaker appear before key civic groups. For example, Kiwanis, Rotary, Lions, Jaycees, Optimists and Ruritan clubs all need speakers and afford excellent opportunities to reach community leaders. If you are feeling confident, you may want to approach people and groups who have not been supportive of preservation efforts in the past. Chances are they are dealing with flawed information and you have an opportunity to invite them as supporters and set the record straight. Whether you are in a one-on-one meeting or speaking before a group of 200, always keep uppermost in your mind your theme and the action you want your audience to take. Be a good listener. Pick up on verbal cues regarding how the people in the audience view preservation, see community priorities and make decisions. Look for opportunities to correct any misinformation or misunderstanding. Look for areas of common concern and interest (e.g. economic growth, education, neighborhood and downtown revitalization, spiritual values, aesthetics) and show how historic preservation might address them. If you can't answer a question-DON'T. It is better to say you don't know the answer to a question than to continue to perpetuate misinformation. Refer to resources included on this web site or contact someone who may have the answer and then respond to the questioner. How important is historic preservation in planning and economic and community development decisions in our community? Are we overlooking its potential? Are you aware of all the tax benefits and financial incentives for historic preservation available to homeowners, mortgage lenders, developers and property owners? Are we doing all we can to revitalize our downtown and our neighborhoods through programs that put historic resources to work? Is our community taking full advantage of the expertise of the Department of Historic Resources, of private organizations such as Preservation Virginia, the Civil War Preservation Trust, the Virginia Outdoors Foundation, the Archaeology Society of Virginia, the American Society of Architects, the American Institute of Landscape Architects, the Virginia Association of Museums, the Virginia Historical Society and of the individual preservation professionals in the area? Learn from your experience. Be flexible enough to refine and improve your pitch as you gain practice and confidence in making it. It is very helpful to set some concrete goals by which to measure your progress. What is reasonable depends upon the size and sophistication of your community with respect to stewardship issues. Success depends upon your continually assessing your progress. Although your strategic goals shouldn't change, you may find that your tactics need to be modified. The successful preservation advocate must know the landscape of the effort, including how to contact, inform and enlist groups already existing who may be natural allies. This often involves being already active with them through membership, subscriptions or participation in events and programs even before the immediate issue of concern arises. Local, regional statewide and even national organizations can help, or offer guidance, but it is those most closely connected to the local situation that can make the most difference. House and Senate bills (at the federal and state levels) are introduced each legislative session. 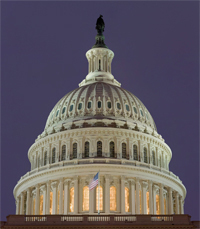 Stay on top of the latest legislative actions that would impact historic preservation by clicking here.